C. B. Harris and Co.
Name: C. B. Harris and Co. Comments: The C.B. 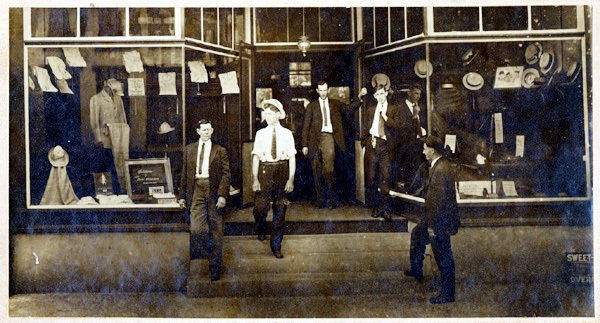 Harris Co. was a men's clothing store operated by Charles Bascom Harris, Jr. in Scottsville. Charles (1883-1959) was the grandson of Miletus Harris, a merchant and wheelwright, who owned this three-storied Harris Building by 1860. Miletus also operated a mercantile store in this building, located across the street from the Scottsville Methodist Church on Main Street. Standing in the store's doorway with his left hand outstretched is Charles B. Harris, Jr. Standing to the immediate left of Charles is John Briggs.